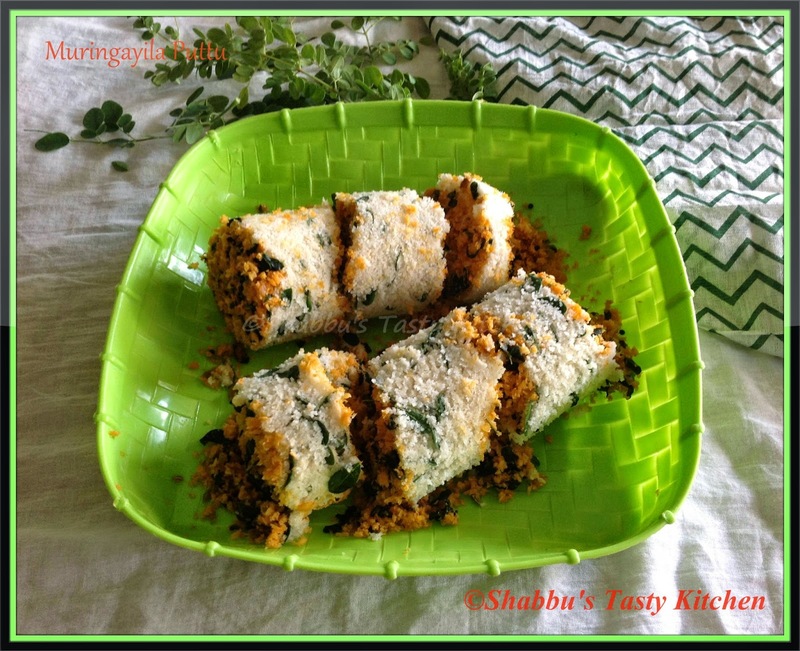 Then add 1/2 cup muringayila / drumstick leaves to this puttu podi and mix well with your finger tips. Keep it aside for 15 minutes. Crush grated coconut, fennel seeds, chilli powder and garlic together and keep it aside. Add few curry leaves, chopped shallots and green chillies and saute well. Add remaining 1/2 cup muringayila and salt and saute for 2 minutes. Then add the crushed coconut mixture and saute for another 2-3 minutes and remove from flame. To prepare puttu, take a puttu maker and layer it with 2 tbsp muringayila-coconut mixture first, then the puttupodi and then again the muringayila-coconut mixture. Repeat the process, till the puttu maker is filled.